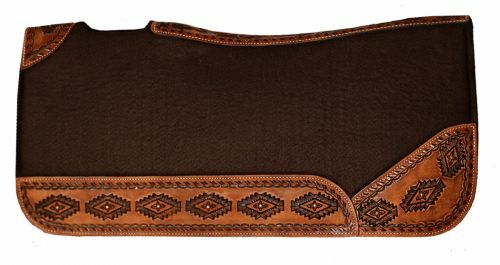 Showman ® 32" X 31" Contoured felt bottom saddle pad with aztec designed wear leathers. This pad features 1" thick brown felt with vented wither and reinforced leather spine. Oversized wear leathers feature buck stitch trimmed and aztec design.